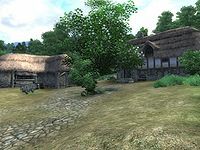 Cropsford is a settlement located along the Yellow Road in the Nibenay Basin of Cyrodiil. The land is in the center of goblin territory, which has historically caused trouble for settlers. During the Alliance War of 2E 582, a large town was located at Cropsford. It was primarily a farming settlement, and had a shrine dedicated to Zenithar. Settlement was strongly encouraged by the townsfolk, many of whom were not natives of Cyrodiil and decided to stay after passing through. The town was constantly plagued by the undead from Culotte, and the Bloody Hand Tribe of goblins. 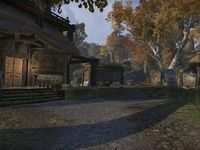 Cropsford was initially located within the territory held by the Ebonheart Pact, although the town and the nearby Drakelowe Keep changed hands many times over the course of the war. It was feared at the time that the encroaching goblins planned a full-scale attack. The town's troubles were clearly too great to overcome, as the settlement was later abandoned. In 3E 433, the land was offered cheaply by the government, and a Breton family from High Rock purchased it. Their plans to build a farm at Cropsford were dashed when they arrived to discover that the land was the center of an ongoing goblin war between the Bloody Hand Tribe and the Rock Biter Tribe over a stolen totem. The Champion of Cyrodiil put an end to the war, allowing construction to begin. It was hoped that Cropsford would one day become a thriving town. This page was last modified on 5 August 2016, at 16:31.